Required: Bachelors Degree in related field. Preferred: Masters Degree in instructional technology, adult education, instructional design, curriculum design or related field. Required: Three to five years experience creating learner-centered instructional content and performance-based instructional systems design processes. Experience with online course design and management tools. Experience with graphic and multimedia authoring software and website design software. Experience in supervisory and managerial positions preferred. *Applies business and ISD processes to lead the development of department and/or system-wide learning programs and interventions in support of the organization s strategic goals and objectives. *Identifies SME s and their requirements to facilitate design, development, and implementation of programs. Provides oversight for design, development, delivery and evaluation of programs by colleagues and vendors. *Develops and implements standards, templates, and processes to ensure efficient, effective, and engaging learning interventions. *Creates engaging and performance driven educational programs/materials using a variety of delivery and instructional methods and modes. *Works with team members and stakeholders to align organizational programs, structures and systems to leverage organizational resources. *Evaluates the effectiveness of learning programs through the monitoring of course performance against evaluation targets. Implements improvements as needed to meet targets. *Builds effective long term relationships with clients to support measurable and sustainable improvements in performance across diverse sectors of the organization. *Acts as a liaison between the department resources and the client to ensure that programs meet client needs and quality standards and reflect sound educational practice; Pro-actively identifies and addresses project issues. Part Time Trainer at RLS & Associates, Inc.
Job Duties: Provide training to New Mexico’s rural transit systems and special transportation providers. Conduct training across the state at various locations; develop and maintain training records, as required. The majority of trainings will occur on weekends. Workload is anticipated to be two weekends per month. Candidate must be willing to travel throughout the state of New Mexico to provide trainings. Minimum Qualifications: High school diploma or equivalent plus two years of experience in public transit or human service agency transportation or equivalent experience in the transportation industry. Persons interested should be self-motivated and willing to travel within New Mexico. Valid driver’s license required. Experience and good working knowledge of Microsoft Office Programs desired. ➢ Perform training sessions and seminars on site. Coordinate all aspects of individually assigned training sessions. Provide follow-up as necessary. ➢ Administer training networks as established in New Mexico. Coordinate trainer meetings, monitor training schedules, and order new supplies as needed. ➢ Perform computer-related tasks and functions. ➢ Perform other related duties incidental to the work described herein. 7. Ability to lift up to 25 lbs. Interested parties should submit resumes to RLS & Associates, Inc. 3131 S. Dixie Highway, Suite 545 Dayton, OH 45439, rls@rlsandassoc.com. Contact Christy Campoll with any questions about the position: (937) 299-5007. Collaborates closely with Northern New Mexico employers to promote workforce development programs to promote economic development. Serves as a liaison with external constituencies and provides professional guidance and leadership for workforce development in Northern New Mexico. Collaborates with regional employers to develop and deliver customized training for workforce development. Manages and submits Federal and State Adult Basic Education grants, ensures compliance with university, state and federal policies and regulations. Manages all financial aspects of the listed programs. This includes multiple funding sources such as tuition, fees, and contracts and grants. Develops annual budgets, approve program expenditures and prepared required reports as mandated by external agencies. Oversees and coordinates the annual grant proposal submission. Oversees Adult Basic Education, English as a Second Language and Community Education programs, including the Summer Program for Youth. Designs, develops and oversees the curriculum for these programs to include diverse activities to engage cross-generational and cross-cultural learning. Oversees program personnel. This includes the recruitment and hiring of non-credit instructors, supervision of staff and coordination of volunteers. Collaborates with University Marketing personnel on schedule production, news releases and press announcements, webpage presence, social media and tabling at community events. Serves as leadership for the programs and collaborate with university departments, K-12 schools, and local organizations to serve the workforce needs of the Los Alamos community and Northern New Mexico. Performs miscellaneous job-related duties as assigned. Must possess Bachelor’s Degree and Master’s Degree. Demonstrated success in workforce development. Understanding of the Northern New Mexico workforce challenges. Knowledge of local and regional employers and workforce needs. Knowledge of federal, state and/or community funding sources and mechanisms. Ability to work effectively independently as well as collaboratively and a desire to achieve. Ability to manage and prioritize multiple complex tasks and to maintain deadlines. Ability to interact with diverse constituencies. Excellent interpersonal, verbal, and written communication skills. Professional appearance and demeanor. Knowledge of grant funding policies and procedures and applicable local, state, federal and university regulations. Three or more years of experience in technical writing, editing, and grant proposal preparation. Ability to synthesize verbal and written sources of information and data into coherent program case statements that meet grantor needs and application requirements. Strong computer literacy with established skills in Microsoft Office suite. Demonstrated attention to detail, professional attitude, and ability to maintain confidentiality. Proactive and action-oriented personality; strong sense of pace and urgency. Experience developing and tracking budgets. Please upload resume or C.V. and Cover Letter. Selected applicant must provide official transcripts. TO APPLY: For complete information including closing dates, minimum requirements, and instructions on how to apply for this or any UNM position, please visit our website at https://unmjobs.unm.edu or call (505) 277-6947, or visit our HR Service Center at 1700 Lomas Blvd. NE, Suite 1400, Albuquerque, NM 87131. U.S. Eagle Federal Credit Union is a local not-for-profit, very for-people place. We are an organization that quietly does the right thing in a world that cant stop talking about doing just that. At U.S. Eagle, you can make a big impact and help create a world where people matter more than profit. As a Learning and Development Specialist, you will make a big impact by collaborating with other awesome people to design, develop, and deliver programs and processes that sustain the positive member and employee experience we are known for. Designs, develops and delivers programs and processes intended to help the organization understand, analyze and create a sustainable and positive member and employee experience. Works with managers to provide best practices and support for coaching staff of the credit union's service culture. Collaborates with necessary departments to establish and sustain our mission-centric culture with the focus on improving our member and employee experience. Advocates for and leads the training and transition needs of employees and members by contributing to change management efforts. Educates management and staff on member experience concepts and processes. Uses business analytics to drive product and program quality improvements based on member feedback and core member service measurements. Identifies training gaps throughout the organization and works with Director of Learning and Development and subject matter expert(s) to address gaps in knowledge. Uses Instructional Systems Design (ISD) to develop employee learning materials in multiple formats and delivery modes. Experience: Two (2) years to five (5) years of similar or related experience. Education: (1) A two year college degree or (2) Completion of a specialized course of study at a business or trade school or (3) Completion of a specialized and extensive in-house training or apprenticeship program. Interpersonal Skills: The ability to motivate or influence others is a material part of the job, requiring a significant level of diplomacy and trust. Obtaining cooperation (internally and/or externally) is an important part of the job and a high level of interpersonal skills are critical to the success of this position. Work frequently involves contacts requiring considerable discussion of problems, material presentations, and resolving issues impacting departments or divisions. Other Skills: Experience creating and delivering presentations utilizing adult learning philosophies. Excellent writing and verbal skills required. Minimum three (3) years financial industry or Instructional Systems Design experience preferred. A background in organizational development is preferred. 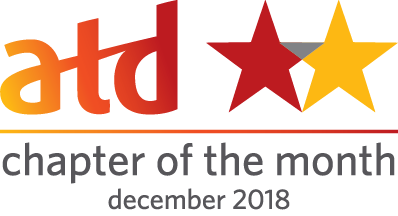 ATDNM wins Chapter of the Month for December 2018! ATD Chapter of the Month. acceptance, and overall chapter strength, growth, and innovation. the Month award is this program’s highest honor. The Department of Earth and Planetary Sciences at the University of New Mexico invites applications for a tenure-track faculty position at the rank of Assistant Professor in the broad field of Sedimentary Geology with demonstrated research expertise that complements existing departmental strengths (see epswww.unm.edu). The position is a full-time, probationary appointment leading to a tenure decision. We are interested in candidates who use field, laboratory, and/or quantitative methods to understand sedimentary geology and/or sedimentary systems. Items must be submitted electronically to UNM Jobs: (https://unm.csod.com/ats/careersite/JobDetails.aspx?id=6930&site=14). For best consideration, all materials must be received by January 7, 2019. The position will remain open until filled. The Department of Earth & Planetary Sciences is committed to building an excellent, diverse and inclusive faculty, staff, and student body. In addition to the highest standards of scholarship, teaching, and professional activity, successful candidates will have a demonstrated commitment to diversity, equity, inclusion, and student success, as well as working with broadly diverse communities. invites applications for an Assistant Professor in Film and Digital Arts. candidate may also teach classes in film history, criticism, and theory. curriculum juxtaposes “major works” with images that contest canonical categorization. stunning landscape in terms of their histories, arts and sciences, languages, and cultural values. 7. 2 links to creative work, or writing samples/published work (not to exceed 40 pages each). Blvd. NE, Suite 1400, Albuquerque, NM 87131. Manages training programs and learning experiences for adult learners in a site. Hires, trains and supervises a staff of trainers. Develops/implements training programs for contact center personnel, which may include management development programs. Develops evaluation and validation instruments to collect and interpret data assessing organizational needs and training program effectiveness. Identifies skill and knowledge requirements for sites/accounts through analysis of data from multiple sources. Designs learning strategies to fill needs as identified through analysis and in partnership with Coaches and Operations Managers. Conducts the most complex training classes. Develops standards for monitoring agents/representatives. Ensures that feedback programs provide agents with guidance to correct problems. Conducts train-the-facilitator sessions to keep trainers effective. Education (if beyond High School or equivalent): Four-year college degree or equivalent directly related work experience. We are looking for an instructional systems designer to be part of the Northrop Grumman's Learning and Communications Solutions (LCS) team in a Part Tim/On Call status in Albuquerque, NM. LCS consists of a diverse talent pool of instructional designers, educational psychologists, software engineers, multimedia developers, user experience (UX) designers, artists, writers, and creative professionals that creates conceptual design solutions for training and information projects in digital media including immersive environments. 1. Creating and analyzing assessments to evaluate learning effectiveness and instructional improvement opportunities, including pre-tests, post-tests, and quizzes. 2. Developing instructional materials and products for technology-based courses, including online, mobile, immersive and performance support. 3. Demonstrates and utilizes effective needs analysis, project management, course development, and evaluation skills. 4. Developing a range of instructional materials, such as self-paced guides, case studies, job aids, and evaluations; scenario-based storyboards; and concepts for mobile learning using smart phones and tablets. 5. Designing and developing training materials and curricula to support program implementation across targeted audiences. 6. Working with subject matter experts (SMEs) to identify specific training needs and develop solutions. 7. Creating and analyzing assessments to evaluate learning effectiveness and instructional improvement opportunities, including pre-tests, post-tests, and quizzes. 1. Bachelor's degree in Communication, Education, Instructional Systems Design or Training & Development, or other relevant degree and a minimum of 2 years of experience. 2. Knowledge of the creative application of the ADDIE model. 3.Knowledge of Learning Theory, Design Thinking, Prototyping Learning/Training Solutions. 4. Knowledge on how to integrate the best of ISD, current Learning Theory with Applied Research to solve Complex Learning and Performance Problems including User Experience and (UX) Design. 5. Developing instructor guides, student manuals, workbooks, and related materials. 6. Developing training that is delivered through digital media, including Web, Video, Mobile Devices. 7. Understanding LMS functionality (course publishing, enrollments). 8. Applying critical skills thinking when solving complex problems. 9. Ability to obtain a Secret Clearance. requiring application of established techniques, procedures, and criteria. This is a grant funded term position. Current funding is available until 31 May 2019. Applicants do not need to have prior experience in all of these areas. complete explanation of UNM benefits.